Man, that is a shocking statement if you don't know why it was made. The implication that our doctor could lie to us sends tremors up many people's spine. I grew up in a neighborhood where many of my good friends parents were doctors and I loved them all and knew them well. I also know they were human. I saw things you don't hear about in the office. I mostly saw honest people. The book "Dead Doctors Don't Lie" is the result of the experience of Dr. Joel D. Wallach. If you have heard him in a live seminar, on a CD or tape or have read his book you know where the title to the book comes from. I believe that the best way to get the whole story is to read his book but I will try and give you some sense of a shortened version of where it came from. Doc grew up on a farm in the Midwest. He loved agriculture and went to school and obtained a Bachelor of Science in Agriculture from the University of Missouri in 1962, with a major in Animal Husbandry (Nutrition) and a minor in Field Crops and Soils. In 1964 he was awarded a Doctorate in Veterinary Medicine (D.V.M. ), also from the University of Missouri. Thereafter, he completed a three-year (1965-68) post-doctoral fellowship at The Center for the Biology of Natural Systems at Washington University in St. Louis, Missouri. In 1982 he obtained a Doctorate in Naturopathic Medicine (N.D.) from the National College of Naturopathic Medicine in Portland, Oregon. Besides studying in his field he worked in related areas and earned a living for his costs and tuition. The title "Dead Doctors Don't Lie" was created by Dr. Joel Wallach after years of research on the subject of health and longevity. Dr. Wallach discovered that the life span of the average doctor in America is several years shorter than that of the average couch potato. Dr. Wallach began collecting obituaries of doctors only to find that many were dying of simple nutritional deficiencies. Doc believes if doctors really know the truth about health and longevity they should be living longer than anyone else, not dying sooner. This premature death pattern proves that doctors are missing some key elements when it comes to understanding what it takes to live a longer healthier life, hence was born the title... "Dead Doctors Don't Lie". Years ago when Dr. Wallach first started giving this message it was very controversial. It is amazing to me that I heard a similar message the other night on the TV show “Boston Legal.” Doc was not credited with the information or was he credited this morning when I heard similar information he has been saying for years given on "NBC Morning News." We are told that we should check with our medical doctor before we do anything that could in any way eventually impact our health. In fact it is mandated by the FDA that anyone without a medical degree can get in big trouble for making any health suggestions to anyone else. The title of Doctor Wallach's book is his way of pointing out that apparently doctors are not trained in all the areas they are given credit for or they would be living longer than the average guy or gal. This assumes they are the fountains of all health knowledge. Doc and "Boston Legal" point out there could also be a financial interest in how our health is dealt with. There is a huge amount of leverage wielded by the medical and pharmaceutical lobbies. In fact Congress has even legislated that the word "cure" cannot be used in regard to Human Beings. Doctor Wallach has spent a lifetime curing animals big and small, domestic to wild beasts. Many diseases we suffer from have been cured in animals and are no longer a problem for them. On the surface it seems it's not in the best financial interest of the human health system for there to be cures. It's more practical for us to have long term care and protocols that last for a lifetime. Dr. Wallach has done over 17,000 autopsies on 454 species of animals and 3000 humans, researching disease, nutrition and longevity. Doc states that Ninety Five percent of chronic and degenerative disease can be prevented and reversed by giving back to the body the missing basic elements of life. As an expert on soils he further states that food supplies do not contain all the 90 essential nutrients. Agricultural soils have been depleted of the vital minerals that your body needs for optimum health. Plants that we eat cannot make these minerals and are now deficient in them. There is no such thing as "Eating Right." If the minerals aren't in the soil where the food is grown, they are not in our foods. We are full but starving for the vital building materials to maintain a healthy active body and lifestyle. Ok, Lets Hear From You. Sometimes it takes someone stepping forward to prime the pump. So, as you know I am a Network Marketer. So what is a Network Marketer? Some of you may think it is your product. Some of you may think it is the company you are aligned with. I believe it is when you truly enjoy meeting and working with people of like mind. One of my favorite things I do as a Network Marketer is business lunch clubs. It is amazing how many there are and how many different agendas they have. Typically you get to have lunch, some kind of presentation is given and you get to do a small commercial about your product or company. These functions can be very profitable for your business. I love face to face social networking. The hardest thing you do is put out your hand and say "Hi, my name is Wes. What's your name? What do you do for a living? Networking always booms in a down economy. Tax incentives, part time extra income, great products, people teaching people are some networking attributes. I love it. Ok, now it's your turn. As you see it doesn't have to be long. Give it a shot. I got my autoship yesterday from Youngevity and they are having a sale. I am including the offer in case you haven't seen it. I know you understand we have great products! Check them out at http://www.mineralwealth.us/ or use your account if you have one. I was talking to someone last night, whose opinion I truly value. The gist of the conversation was that I might be too long winded. These last 2 weeks have been pretty in-depth and I know time is valuable to all of us. Anyway, I think some changes in format are in order. Say, Monday and Thursday the information will be "On Youngevity." The other three days we all want to hear from you. I say "we" because, even though this is technically my blog, if you can't take ownership also, no one will have a reason to visit this but me. We want to hear from “you.” I hope you are here and care enough to take your time and speak your mind. I would like to steer the conversation to a topic, if that's ok. So, the question for today is: What do you do for a living and how is this economy effecting your employment and your industry? If you want to remain anonymous that’s ok, but my hope is we will all get to know each other. My other hope is that you will have fun and invite like-minded people to chime in also. I am about Youngevity but of course it isn’t required that you be in Youngevity to get something out of this blog. Another thing that would be great is pertinent testimonials on the current health and business topics. You need to give your name and contact information on those, so we meet the FDA and FTC rules on testimonials. What Are Some of The Uses For Plant Derived Minerals? We have a lot to thank Dr. Wallach for when it comes to Youngevity Plant Derived Minerals. First, he explained nutritional minerals and the factors they play in our health. Next he found a source of minerals that fit his requirements for us. Finally he contracted that the product would be exclusive to Youngevity. It is incredible to be an independent distributor in Dr. Wallach and Dr. Ma Lan's Youngevity Global business. So what are some uses of Plant Derived Minerals? The first and most obvious use is to drink the minerals. When Blake Graham introduced the minerals to the Japanese he found they were amazing when it came to finding alternative things minerals are good for. Blake provided this list of some of their uses for our minerals. spray Cheri-mins as a mini-snack! It's incredible that a product can have so many uses. It is even more incredible that Doc and Steve have priced this product so reasonably. The wholesale cost of Youngevity Plant Derived Minerals for each litre, which is a months supply, is only $18.00. Each litre contains a natural assortment of approximately 19,000 mg of 100% Organic Plant Derived Natural Mineral solids fully suspended in filtered water. A list of the 70+ contained minerals is available. Be sure and use the product according to the directions on the bottle. Try them for yourself. You will be glad you did just like I am. You can order from your account, or from the person who sent you here or you can get them from my account at http://www.mineralwealth.us/ if you are hearing this for the first time. So now we know what we are looking for, where do we go to find these incredible minerals? I suggest we follow Doc Wallach to the mine. Your first question should be "Mine? How do you pick plant derived minerals in a mine?" I thought the same thing myself when I first heard the concept. For the complete story I refer you to Wellness Publications, Dead Doctors Don't Lie by Dr. Joel Wallach and Dr. Ma Lan. In 1925, a rancher in Utah made a historic discovery when he found the remains of an ancient rain forest that had been uniquely encapsulated and preserved. This material known as humic shale was laid down at a time when the earth was young. This was a time when the earth was abundant with many minerals in the soil. Trees, plants and fruits contained at least 77 water-soluble minerals, which provided luscious, succulent, vibrant, life-sustaining food. At this time there were no carcinogens in the air and trees and vegetation grew and then fell back to the ground. What resulted was a giant compost pile that grew thicker and richer for thousands of years. Realizing the value of what he found, the rancher mined this material and developed a leachate process to extract the liquid minerals, which were first bottled and sold as mineral water in 1926. Today small portions of humic shale in southern Utah, are mined and the minerals extracted with clear, pure, cool water to the desired balance and concentration. The mineral leachate is then processed through a complex array of special filters to allow only the organic plant derived colloidal minerals in the final solution. The result is the premium Majestic Earth Plant Derived Colloidal Minerals product that meets Joel D. Wallach's quality standards, time-tested and enjoyed for over 75 years. This mineral product is 100% organic, containing neither metallic minerals or salts and is not manufactured from ground up rocks, bentonite, soil, clay or ancient sea beds, which are the most common sources of other so-called “colloidal minerals.” As a final protection against rock-based minerals contaminating the product it is run through a reverse osmosis filter system the equivalent of forcing water through a phone book. No rock-based minerals are ever present in Doc’s products. What this means for us is that the minerals are water-based and your body will use what it requires and slough off the rest. I've been many times to the mine and would like to give you a tour with pictures. This does not in any way compare to the real thing. When you get a chance to go, be sure and do it. A huge benefit of the mine tour is the few hours we are taught by Doctor Wallach, Steve Wallach, Dr. Gehard Schrouser, Blake Graham, Todd Smith, Richard Renton and many other leaders and experts on the bus ride to and from the mine. Our hosts at Total Nutrition are always incredible at making this a huge value for the money. There are generally at least two Trailways Busses full of people and the lunch at the processing plant is always great. There is a huge benefit in being with friends and like minded people in your organization as you find out about the mineral heart of Youngevity. incredible to realize a natural product like our minerals exists and that we are the only ones that have it. Many nutrition stores sell a colloidal mineral but check the label. Their product has around 900 mg of minerals but they are ground up metallic mineral. Their minerals settle to the bottom of the bottle. Also, the absorption rate is very low, 2 - 12%. We have a guaranteed 19,000 mg of around 77 minerals. Our absorption rate is 98%. We have the bang for the buck and your health. Again, read the labels. What about Dr. Wallach's minerals? So, Friday we learned minerals are 60 of the 90 essential nutrients. We learned that the food we are eating is on a steady down slide in nutritional value because of where it is planted and how many plantings have been made in the soil it comes from. It makes sense that every crop removed, reduces the value of the minerals in the soil. We learned that Dr. Joel Wallach, in his research has shown there are more than 900 diseases caused by nutritional deficiencies. My question is, “Do you believe it?” Have you surfed around and checked up on what I am saying? Have you checked with your grocer to ask, “How many days prior to putting your fresh produce on the shelf was it picked?” Do you think it matters how much sun a plant is exposed to in relation to its level of nutrition? How much sun does your tomato get in a shipping crate? These things are about nutrition not insecticides. If these things are a given and you agree, then what about where was the plant grown? Are gold and silver found everywhere? If they are, we should all be rich. Nutritional minerals are the same. Each mineral is found where it is found. Sounds obvious but if it is obvious then why do we believe if a patch of soil will grow a simple plant that it can provide all the minerals required for a complex human. There are three types of minerals used in supplements. 1- Metallic minerals are rock or shell based, and are 2 to 12% absorbable. The human body is not capable of processing iron in the form of rust scraped off a railroad track and in fact metallic minerals can poison humans. Rust is only an example. Percentage of absorption indicates if there is 100 mg in a product and you receive 3% absorption you know there is 100 mg present in the product but your body only absorbs 3 mg. When you read any label look at both factors. 2- Chelated minerals are when a mineral is bound with a more absorbable substance, such as an amino acid. This raises absorption in humans up to 40%. According to Dr. Wallach this process was developed in the veterinary field of medicine. 3- The safest and most effective way to get your minerals is from plants. Plants take large molecule minerals with a positive ionic charge from the soil and through photosynthesis break these molecules down into smaller sizes (7000 times smaller than a red blood cell) and give them a negative charge. Basically the plant pre-digests the minerals for us. These minerals are water-soluble, up to 98% absorbable, non-toxic and safe for the body - the way Mother Nature intended us to get our minerals! Whilst plant derived colloidal minerals are considered to be 100% safe for pregnant and nursing mothers when used as directed, it is recommended that a healthcare practitioner be consulted. Out of the three types of minerals I believe we can agree that the most effective for us nutritionally are the plant derived minerals. Those minerals can also be in the form of fresh vegetables or eating animals that have eaten fresh vegetables or grass. We recognize and recommend everyone eat a well-balanced diet. But, as we recall from the information on the declining value of our fruits and vegetables according to the US Agriculture Department, depending wholly on food for our nutrition can be a health gamble. Based on this information it seems imperative that we supplement the food we eat in order to balance the nutrition required for our optimal health. Tomorrow I will let you know where Dr. Wallach and Youngevity get these fantastic proprietary minerals and how they are processed to provide us such a fabulous product. The FDA has not approved or seen the information. Check with your doctor. What is Unique About Youngevity? Plant Derived Minerals! Dr. Joel Wallach as a veterinary pathologist performed 17,000 autopsies on animals and 3000 on humans for comparison. In his research he determined there were 90 essential nutrients. Essential meaning, if any of those nutrients were missing over a period of time at least 10 diseases, and some many more, for each deficiency could be the result. Minerals account for 60 of those 90 essential nutrients. Every year the nutrient value of minerals in the foods we eat is decreasing. As a result it is necessary that we supplement to insure our supply of minerals is at the essential level or above. Dr. Joel Wallach has said, "Minerals never occur in a uniform blanket across the earth and plants cannot make minerals. Farm soils are either exhausted of organic material, depleted of essential minerals or the minerals are bound up and unavailable to the plants. The plants grown in these soils do not contain the minerals the body needs. Therefore, unless you supplement with minerals, there is no guarantee that you will get all you need through the five food groups." The last report from the USDA Nutrient Database compared data from 1975 to data from the year 2004. This comparison is very troubling. As you read these comparisons keep in mind Dr. Wallach's statement that mineral deficiency leads to disease and think about what we hear every day in the news, on TV and in magazines concerning the state of health in the United States and the world. The World Health Organization reported in 2002, when I joined this company, that the United States was ranked 17th in the world for health and longevity. At that time there were 16 other countries with better health than the United States. Today The World Health Organization reports that we are 46th in the world. It is interesting to note that we have the best medical system in the world. It must be the best, because we spend more than the rest of the world put together. Yet there are 45 countries in better health than we are and that seems to be a growing trend. Why! These are only two of the 60 essential minerals Dr. Wallach calls for to achieve optimum health. That leaves 58 to compare. Being deficient in minerals is a factor in causing our level of health to decrease. To compare the rest of the essential minerals go to the usda.gov nutrient database. Monday I will tell you more about our Liquid Plant Derived Minerals. October is such a wonderful time of the year. The fall colors have been just brilliant with all the water we are receiving. This is kind of a laid back season usually and I hope you’re relaxing from your busy summer activities. Along with the let off from summer and the space between the holidays comes some extra time on our hands. You could work on building a residual income that will finance you through the Christmas season. I know December is a tough time of the year because of the financial drain from what we buy for our loved ones. Wouldn’t it be great this year if you had a residual income of an extra $500 a month for the holidays? In fact the money could continue and just increase through the first of next year, until it runs into tax time. This is something to think about before you get to April 15th. Tax Preparation is what you do the night before you submit your paperwork and money to the IRS. Tax Planning is what you do for the year preceding paying your taxes, the records you keep, the work you do and what your business intentions are. It works for me. All the political hoopla about small to medium business the candidates are throwing around could be referring to you. I'm pretty sure with the economy the way it is, a little or even a bunch of added security wouldn't hurt your feelings. I know that a lot of you make great incomes and many of you only use the products from Youngevity for the health benefits. I understand, because health benefits are what brought me into the company. But, I am one of those blabber mouths that when I find something that has really helped me, I have to tell people about it. It’s kind of like going to a great movie; you want to tell everyone about it. The only difference is that what we have in Youngevity relieves pain, gives energy, extends life and the list goes on and on. Another great benefit is that, unlike movies that pay us nothing, we can get a thank you note from Youngevity in the form of a check. I know you know all this and I'm not pushing, only reminding. Some of you have a business outside Youngevity, and have access to all the tax deductions of a business owner. As a business owner you have one hundred fifty seven legal tax deductions. For those that are just employees or retired, there are basically only three legal tax deductions. 4. There’s no way I can deduct my car mileage to and from work @ .48 cents/mi. Something about the United States, so far it's a free country. Nobody has to do anything they don't want, as long as there's no law. The cool thing about taxes is there is a law and Congress wants us to follow it. If that law says I can pay less taxes then I'm all for it. These statements have not been evaluated by the FDA. This is not intended to diagnose, treat, cure or prevent any diseases. Income is solely up to each distributor to develop. Results vary with each business. Wow! Three blogs in a row on the Residual Income Game. You must think I really believe in their game. I do believe you can learn more in a couple of hours of playing Residual Income about building your business then any other way for the same amount of time. I do know it’s very fun and a great way to spread the word and teach people about networking. I own three games. I also found out, at the game play, they will sell you the new updated version of the game for a reduced amount if you previously purchased a game. The great part is you get to keep the old game. There have been some significant changes making it easier for people to understand and play. I am definitely going to pick up on that deal. Give them a call at 1-866-707- 9555 for the details. Residual Income® was designed by instructional design master, Clay Stevens. With 30 years of experience in curriculum development and training, Mr. Stevens has spent significant time examining and researching how people learn and retain information. During the course of his life, Mr. Stevens has developed a 6-figure income in three separate network-marketing companies. He saw the need for a more efficient and effective way to teach new associates how to recruit, train and retain a downline. After retiring from the industry as an independent distributor, he devoted his skills to inventing a training mechanism that could help anyone in any network marketing company build a high-income generating business. Clay Stevens is a great guy and a personal friend of mine. We met at the inception of them beginning to market the game. They came to a networking luncheon that I regularly attend. When they explained the concept of the Residual Income Game my antennas went up and I knew I loved it right away. We organized a gameplay for my Youngevity group and I realized from the excitement of my friends playing the game what a great tool Clay had created. I was able to invite Clay and Rod to participate in two of our major Youngevity conventions. They were very well received and everyone is benifiting from their instruction and games. I'm aware of other networking organizations involved in using their training system and games. Because of their great integrity I'm not worried of any crossover of other systems. Master networker, Clay Stevens unlocks the key to your personal "Transition to Wealth" by showing you two states of mind that are as real as the behaviors making or breaking your success. Find out about the transition from the land of Paucity to the land of Bountiful. This came out before The Secret. Distribute this audio liberally to recruit and train others. Start at Done is a 2 disk audio set by Clay Stevens that describes the benefits of building an income that comes in each month without having to start at zero. Mr. Stevens lays out a step-by-step strategy on how to get your income to start at done at the beginning of the month. I have both of these and listen and study them regularly. Last nights Residual Income Game Play was a smashing success! Mike Vande Sluis was the big winner in cold hard cash. Mike walked away with $100.00 dollars from Double Diamond Nephi Wayman towards his cost of the Youngevity Convention in February. Mike will be in Las Vegas this spring rubbing shoulders with millionaires, learning and playing his way to financial freedom. Speaking of millionaires, we were visited by Blake Graham. Blake is a Triple Diamond legend in Youngevity and he and his partner Todd Smith will be the hosts of the Diamond University in Las Vegas. Every year we are treated to an education fit for kings and queens at these events. It is incredible to not only have Doc and Steve and the whole Youngevity team giving us incredible training, products and support but the training from the distributor side is phenomenal! These leaders are in the trenches building business and have their finger on the pulse of the industry. If there is a new technique or a trend they pick up on it right away with the thousands of distributors they deal with regularly. I have to say that there were excited people at the game last night. We began playing at around 7:30 and finished the last moves at 10:30. You may think that's a long time but the truth is those in the game just didn't want it to end. It's incredible to see a simulated Dentists income go from 5 or 6 thousand dollars to 35,000 in the period of 3 hours. It didn’t take long for each player to pick up, because of the game, things they are missing in promoting their real world business. Each player learns that it is necessary for most of us to grow to become leaders. Many people coming into network marketing think they are ready now to be a leader and make millions. Very few, say one in 10 thousand are born networkers. For the rest of us, we need some time to emulate our upline, read books, listen to training media, attend workshops and conventions, but most of all we need to practice what we learn in all these venues. True networkers know that Network Marketing is not a get rich quick business. If you are making a ton of money out of the gate you are in direct sales. The ones with residual income, that is job dropping and that lasts for generations, build their business by helping others meet their goals and along the way it happens for the leader. Zig Ziggler has said for years that, "If you help enough people get what they want you will get what you want." I would like to comment about the Residual Income team. Rod Richardson and Norma Strange are partners in the business. They were there to guide our game journey. We were lucky enough to have Rod as the facilitator for our game last night. Rod is well educated in business and leadership training. You can see his full bio at http://rodalan.wordpress.com/about/. The best way to know "he knows networking" is to be around Rod. As he facilitates the Residual game play it is awesome to see and hear his wealth of networking and business knowledge. Rod is not a stuffed shirt lecturer. He is exactly the kind of person we all dream about sponsoring in Network Marketing. He knows what to say, when to say it and who to say it to. The problem is "he is already taken." His great talent and first priority is opening the game player’s eyes to those ideas as they play the game. His business is teaching others to be the kind of person he is. It is a comfort to know that what ever people, in whatever networking business, are sitting in his chairs they will get his undivided attention and the best he has to offer. This game and the Residual Income Game team’s only goal is to help you create network marketers out of your business members and you. I really recommend that you be in a game with their staff because it helps you to be able to use the game more effectively. You probably think I really like Rod. You are right! He is a great guy that really improves the image of our industry. I recommend his AUDIO: Perpetual Wealth™ - $23.95 ...Buy Now! => A single CD audio program by Rod Alan Richardson discussing the formula on how to transcend money and achieve perpetual wealth. Learn the steps on how to move from financial security, to freedom, and to wealth. Tomorrow I will tell you about the creator of the Residual Income Game, Clay Stevens. We have re-discovered what we all knew in kindergarten. We learn more from playing than we learn in lectures! 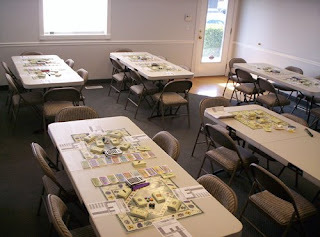 We are getting together tonight for a game that teaches us how to make more MONEY. Could anyone use that in today's economy? The winner will get a $100 towards a ticket for the Youngevity, Vegas Convention in FEB. Entry cost is $0.00! I apologize for the short notice. We found out today about the game. I've also learned that Youngevity Triple Diamond Blake Graham will be in attendance tonight at least long enough to say hello. He is here from Tokyo for a few days. Blake and his partner are the highest paid distributors in Youngevity. Since you learn best by doing, why not learn in an environment that allows you to actively practice the success pattern of Network Marketing. Then you’ll know what to do since you have done it. With the Residual Income® Game, you’ll have a proven tool that can accelerate your results to achieve "break even" in 30 days or job-dropping residual income in as little as 90 days. Others have achieved these actual results from committing to weekly game plays and engaging in this dynamic effective training. Game-based training reinforces and focuses everything the distributors have heard in traditional forms of training – events, audios and books – giving them a way to actively practice and let the game guide them to success. The Residual Income® Game lets players experience what it feels like to achieve a high income in Network Marketing and all the steps it takes to get there. After two hours, players will have practiced dream building, making lists, promoting products, approaching prospects, and edifying people in an environment that is difficult to tell from reality. The Residual Income® Game is a game but try and tell that to your mind. Your subconscious treats the experience like the real thing. You embrace the high energy feelings of making huge sums of money in Network Marketing and it transfers to your success in your business. We welcome you and there is no charge, so come check it out. You will be glad you did! Turn Left (North) at the first stop light and follow the road to the end. The office is the fist condo unit on the left before you come to the end of that road. Building a Youngevity Business isn’t hard! How many of you recommend movies, hairdressers, or restaurants? Do you get a check from those businesses for performing that service for them? I’ll wager you're shaking your head “no.” Do you know you can get a 20% to 30% commission check from Youngevity, for being qualified and recommending their products. I'm sure you are aware that good nutrition costs money! No one gives it away. But, in Youngevity you can get first class products paid for (free to you) by recommending them to other people. Tell them how good you feel. Most people, in a health maintenance mode, don’t need to spend a lot of money to receive great benefits from our products. $18.00 a month for the Plant Derived Liquid Minerals will give you a huge advantage by providing 60 of the 90 essentials Doc recommends for optimum health. If you have health problems and want to address those extra issues you may need to add a separate product. Our product line is so diverse that anyone can find products that will help him or her. If you don’t like the taste of one, there is probably another that will also do the job. If you don’t like capsules, we have liquids. A WARNING TO THE AMERICAN PEOPLE! "Our physical well-being is more directly dependent upon minerals we take into our systems than upon calories or vitamins, or upon precise proportions of starch, protein or carbohydrates we consume. Do you know that most of us today are suffering from certain dangerous diet deficiencies that cannot be remedied until depleted soils from which our food comes are brought into proper mineral balance? The alarming fact is that foods (fruits, vegetables and grains) now being raised on millions of acres of land that no longer contain enough of certain minerals are starving us - no matter how much of them we eat. No man of today can eat enough fruits and vegetables to supply his system with the minerals he requires for perfect health because his stomach isn't big enough to hold them. The truth is that our foods vary enormously in value, and some of them aren't worth eating as food... Our physical well-being is more directly dependent upon the minerals we take into our systems than upon calories or vitamins or upon the precise proportions of starch, protein or carbohydrates we consume. This talk about minerals is novel and quite startling. In fact, a realization of the importance of minerals in food is so new that the textbooks on nutritional dietetics contain very little about it. Nevertheless, it is something that concerns all of us, and the further we delve into it the more startling it becomes.You'd think, wouldn't you, that a carrot is a carrot - that one is about as good as another as far as nourishment is concerned? But it isn't; one carrot may look and taste like another and yet be lacking in the particular mineral element which our system requires and which carrots are supposed to contain.Laboratory test prove that the fruits, the vegetables, the grains, the eggs, and even the milk and the meats of today are not what they were a few generations ago (which doubtless explains why our forefathers thrived on a selection of foods that would starve us! )No man today can eat enough fruits and vegetables to supply his stomach with the mineral salts he requires for perfect health, because his stomach isn't big enough to hold them! No longer does a balanced and fully nourishing diet consist merely of so many calories or certain vitamins or fixed proportion of starches, proteins and carbohydrates. We know that our diets must contain in addition something like a score of minerals salts. It is bad news to learn from our leading authorities that 99% of the American people are deficient in these minerals, and that a marked deficiency in any one of the more important minerals actually results in disease. Any upset of the balance, any considerable lack or one or another element, however microscopic the body requirement may be, and we sicken, suffer, shorten our lives. We know that vitamins are complex chemical substances, which are indispensable to nutrition, and that each of them is of importance for normal function of some special structure in the body. Disorder and disease result from any vitamin deficiency. It is not commonly realized, however, that vitamins control the body's appropriation of minerals, and in the absence of mineral's they have no function to perform. Lacking vitamins, the system can make some use of minerals, but lacking minerals, vitamins are useless.Certainly our physical well-being is more directly dependent upon the minerals we take into our systems than upon calories or vitamins or upon the precise proportions of starch, protein and of carbohydrates we consume. This discovery is one of the latest and most important contributions of science to the problem of human health." (Spelling and grammar vintage 1936)Above = Excerpts from Senate Document No. 264, 1936.If the U.S. Congress was concerned about depletion of minerals in 1936, how much more concerned should we be 67 plus years after the concern was made. Just like in 1936, farmers today can still “not afford” replacement minerals for our farm soils. The problem has just gotten worse. Dr. Wallach has stated, "You must give your body all the raw materials it requires to maintain and renew itself in order to achieve healthful maximum potential." But those raw materials so vital to your health can be hard to find. Centuries of mining, farming, irrigation, and acid rain have eroded life-giving minerals from our soil. These mineral-deficient soils are then used to grow and cultivate our food. Because of this, our food may be lacking in essential minerals. In fact, Dr. Wallach has stated "one sentence has killed more people than all the wars in American history. . . You get all the nutrition you need from the four food groups." All Youngevity® products are designed with this principle in mind. Our products are packed with the finest minerals available. Mined from deep within the mountains of Utah, these minerals are harvested and added to create our products. Along with a healthy lifestyle that includes a proper diet and exercise, these products can help you live a fuller life. When it comes to mineral supplementation, you should use only the finest products available - Youngevity® products! When you go shopping, there are always generic brands and imitations vying for your attention. But when it comes to your health, do not accept any imitations. There are no quick-fixes, no silver bullets, and no shortcuts. The only way you can heal your body is to give it all the raw materials it needs to run stronger, faster, and longer. See you tomorrow Wes This message is not meant to diagnose or prescribe. Yesterday I touched on the Las Vegas convention and about our fabulous Youngevity conference calls. Today I would like to continue with our Youngevity training and what we have available. ~ We have the opportunity to bathe in a fountain of youth by listening every weekday to our own Dr. Joel D. Wallach. We can sit at his feet and soak up knowledge that will change our lives. That's a little flowery but absolutely true. Doc is on the radio weekdays at Radio Channel KSCO in the Bay Area. If you are like me and live somewhere else in the United States, you can also hear Doc on the web at http://www.ksco.com/ and even hear missed shows and RSS feed your computer and personal devices. When you go to KSCO look in the bottom right corner for “Dead Doctors Don't Lie.” Click on that button. Doc is a conservative. He always gives a monologue on current events in health and nutrition and whatever else he thinks is timely and important. Doc takes live questions from the phone and it is eye opening to hear the changes in people's lives that he is able to facilitate. His goal is to make us well. Doc is a veterinarian and a physician and in keeping with his role as a veterinarian some say, “He may treat you like a dog but you seem to get better.” I know that Doc and his products saved my life and I'm forever in his debt. There is a great video put together by our good friend and up-line Triple Diamond Todd Smith. The name of this video is "Mineral Story". If you go to http://www.mineralstory.com/ and click on the broadband option you will open a window and see a small vision of what Doc and Youngevity are all about. ~ Doc also gives live lectures 300 times a year. You can check out his schedule at http://www.youngevity.com/company/wallach_schedule.php . Keep an eye on where he is and don't miss hearing him in person. Doc is a man of integrity. He and his son Steve run Youngevity with the same integrity. Sorry I missed writing to my blog yesterday. My trusty old disc drive crashed. I spent the last few days restoring my computer. Today I'd like to talk some about Youngevity training. One of the things that are very important when choosing a network marketing company is what kind of help you will get. The great part of Youngevity is that we have a plethora of help. This is not a Lone Ranger business. Youngevity has incredible conventions with awesome opportunities for us to learn and grow. This spring our convention is February 6th-7th in Las Vegas, Nevada. There is also a Diamond University on the 5th of February before the convention. There will be many chances to get to know other Youngevity Distributors at this event. Dr Joel Wallach, Suzanne Somers, Doug Firebaugh and Dr. Corey Gold have been announced as the lead speakers for the convention. I have been to all the corporate conventions since 2003 and I have to say they are incredible extravaganzas. Youngevity is a multi-national Network Marketing company owned by Dr. Joel Wallach and his wife Dr. Ma Lan MD. Dr. Wallach is known through out the world as 'The Mineral Doctor.' Doc, could easily also be known as The Millionaire-Maker. That's because Dr. Wallach has helped a growing number of alert entrepreneurs reach their dreams of owning a million-dollar business. And he's done it by showing them how to help end America's mineral deficiency crisis. The test of our work from home business is that it have viable products that are unique. Unique means customers can only get them from our business. The next requirement is that the products are consumed regularly. Our products are consumable and require regular replacement. The next requirement is that the products be worth buying even if there is no business opportunity associated with them. Historically, ninety-seven percent of Youngevity Asssociates have become involved only to purchase our products and receive the health benefits they feel come from eating them. The last few years the Wallach's have brought many non-nutritional products into our product line. They are equally unique and special. If you are going to make money in your work from home business it's required that a great compensation plan be associated with the business. Youngevity is a uni-level plan with compression and a payout to infinity. It's the best pay plan I have seen. For the layman that means you can help as many of your friends become involved with you and any of them or their friends can do the same. Under this plan, if you are meeting your qualification requirements you will be paid as deeply as you are qualified, which can be all the business brought in by you and your team. The Associates coming into Youngevity with the desire to make money can do very well. No income promises are made, but it has been proved you can make millions of dollars. Youngevity is not a get rich quick scheme and it requires effort and generally personal growth to reach the highest levels. It's not required for you to be a sales person, only that you sort out five people who are as interested as you are in building a large business. Then just help them do the same. Exact written Compensation details will be made available prior to any commitment. So a little recap might be in order. I have hit on my health and some other facts about me. I touched on the state of the economy and where we are in it. I talked a bit about Doc Wallach. I spent a day on tax savings of a working from home business. What’s next? One of the concerns people have, even in this period in time is ~ WHAT ABOUT PYRAMIDS? It's funny when we are naming stadiums and convention centers after MLM companies and most everyone knows of someone that has made it big in Networking, that question still gets asked. I could jump right in and begin with my thoughts on the subject but there are so many experts out there that I will defer to them. One such expert is Tim Sales. He has been a legendary leader and teacher in network marketing for years. He and Dr. Charles King, a PHD from the Harvard Business School and a professor at the University of Illinois Chicago, did an incredible presentation on network marketing. It has stood the test of time in being the best explanation ever given. The title: Brilliant Compensation. Controls are at the top of the screen. Who should watch this video? Everyone. If you are in network marketing and have ever had any guilt feeling sharing your business with your friends, you should watch. If you don’t know about the business or have only had a brief flirt with being a networking distributor, you should watch. If you have been a long time product user in a networking business and regularly get your Autoship of your favorite product but never look into what else is available from your company, you should watch. Are you struggling financially? Are you looking for a way to add five hundred dollars to your monthly budget? If you have huge dreams and aspirations, you should watch. If you have ever been asked if MLM was about pyramids or "is MLM legal", you should watch. Get the picture? Everyone should watch!